Is your horse occasionally reluctant to pick up either lead? Or maybe your horse fights you all the time on just one lead? It could be a sign of hind end lameness. Pain in the hind limbs, whether due to a stifle, hock or other issue, will alter a horses’ behavior under saddle. Today we will discuss a few stifle issues. There are a number of conditions which can affect a horses’ stifle, from arthritis to congenital defects of the cartilage such as OCD. Any of them can severely affect your horse and his willingness to do his job. The most unique condition of the stifle comes from horses’ ability to sleeping standing up. Horses have an anatomic adaptation which allows them to “lock” their knee in place so they don’t have to burn muscle energy to stay upright. The patella (knee cap) of the horse does the “locking”, which allows the horse to utilize both bone and ligaments, instead of muscle, to stay standing while they sleep. This condition is more likely to occur in a horse with straight hind limb conformation or upright stifles. Though UFP often presents in one limb, both limbs are likely affected. In addition to the conformation of the horse, another significant factor that contributes to UFP is the fitness level of the horse – or rather, lack of. In an out-of-shape horse, there can be a laxity in the patellar ligament, allowing for the upward fixation. 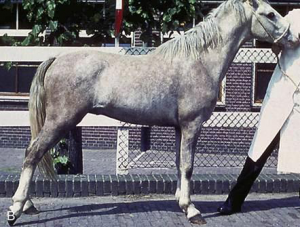 This fixation can occur in different severities, leading to varied levels of lameness. 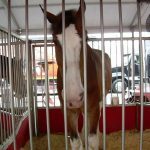 There are multiple treatment options available, and it’s best to consult your veterinarian about the best option for your horse. 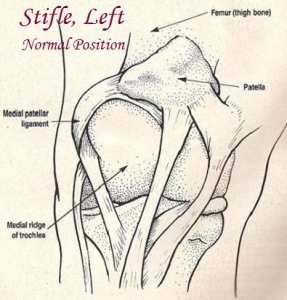 Arthritis, or inflammation of the stifle joint, is a very common finding within our practice. Arthritic horses will present with a decrease in desire to work and, if severe enough, a very visible lameness – which is often a shortening of the stride on the affected limb. On exam they will have an effusion, or swelling of the joint. Like any arthritic condition, stifle issues are cyclic in nature. The inflammation will break down the joint structures and joint fluid, which will cause more inflammation. There are a number of treatments that can break the cycle, and discussion with your veterinarian is a must to individualize the treatment plan to your horses’ severity and desired activity level. Though stifle issues and injuries can severely hamper the ability of a horse to perform, they are often easily maintained, getting the horse right back to work, whether that is on the trail or in the ring.